Just a quick post to let you know that the long-anticipated Christmas dies... Bigz, Movers & Shapers, and Sizzlet strips are now available in the shoppe. Hurry... they'll go fast!!! 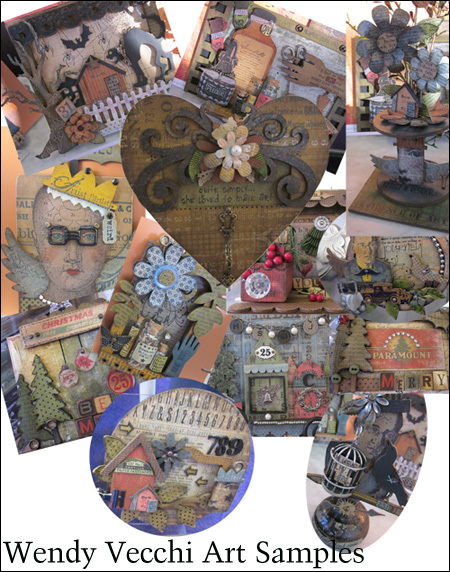 In last week's newsletter, I promised some photos of Wendy Vecchi's sample projects that graced our shoppe during her weekend workshops. I saw quite a few flashes going off... such great inspiration! Our November class schedule is shaping up nicely... Judi and Rob, owners of JudiKins stamps, are visiting us the weekend before Thanksgiving when Savage Mill kicks off the holiday season with "Magic at the Mill". Judi is teaching three classes and doing some demos too. Check our November class schedule for details, then call to reserve your spot! We just received a shipment of the newest stamps from JudiKins... we are NEVER disappointed! Come see for yourself. Oh Hi, didn't hear you come in. My name is Honoré. I am a career-graduate (think retired) public librarian and I've been a Queen's Ink customer since circa 2004. One of the things I like most about being a career graduate is the fact that it reminds me so much of kindergarten. Everyday I wake up - well, most days - and say to myself: "Let's see, what shall I do/play with/learn today? The options are endless; for example, I can read, art journal, knit, quilt, go to a museum, treat myself to a long, leisurely lunch alone or with friends, or take a class either online or in person at places like the Queen's Ink. Even if there isn't a class scheduled, I might just pop in to see what's new - I just love the displays of projects, papers, stamps and other supplies - and to spend a few minutes chatting with Patti, Lolly and Janet. 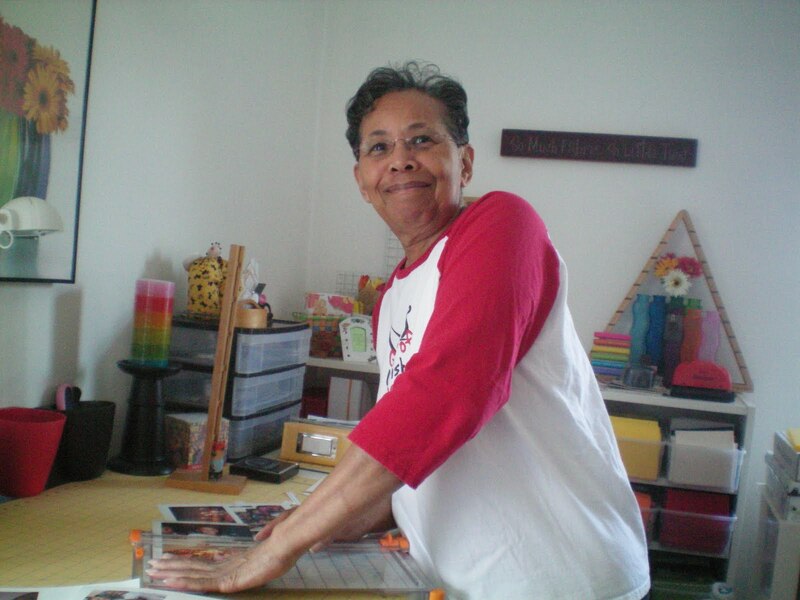 Many times, I am there when a new shipment arrives - magazines, new stamps or a new goodie like the new Gelli Arts Gel Printing Plate Lolly profiled here - are being inventoried. A couple times a month, I'm going to post to this blog, sharing with you tips, tidbits, insights and news about the Queen's Ink from my point of view as a customer. In my next post, I'll share with you some of the pieces I made with the Gelli Arts Gel Printing Plate. Yep, I bought one. I'm looking forward to connecting with you via this blog. Thanks for stopping by. PS. My shirt reads: Queen of Unfinished Projects. I thought it was appropriate for this blog. Gelli Arts Gel Printing Plate... what fun! Have you ever wanted to try gelatin printing, but didn't want to deal with the mess, the storage issues, or the mold that grows over time? I saw a demo and had a chance to play a little bit with a new product that makes it easy to do gelatin printing and couldn't wait to show it to Patti! GelliArts has created a fabulous gelatin-like surface, available in two sizes, that enables you to create monoprints using paint, stamps, stencils, fingers, and your imagination. Patti immediately placed an order, and we've already had to restock! You have to see this in action only once to want to join the fun. Patti has many samples available using different kinds of paper... tissue paper, watercolor and printmaking paper, manila tag paper, fabric... endless opportunities using different surfaces! We would love to see what YOU create with your GelliArt plate, so send a photo to webjester@queensink.com.